Hey guys. I am having issues that I belive are being caused by my CPU running too slow. CPU is currently running at at 0.76hz. The max is 2.30hz. I have tried going into control panel>power options, and selecting High Performance but it still remains at 0.76hz unfortunately. By any chance would anyone on this site know anything about how I could increase form 0.76hz? Below is my spec. I would appreciate so much if anyone could advise me with this. Thanks again. As an asides Concept82, I note that you have requested help with this issue elsewhere albeit that you have yet to receive a reply there, it is not advisable to follow guidance from more than one forum as it can cause confusion as to who`s help you are following and mishaps can then happen, please decide on which forum you wish to continue and as a courtesy notify any other forum that you no longer require assistance. Apologies for that. i have been desperate to find some solution as soon as I could so had tried one other forum previously to here. I have since cancelled that request just now. Basically I am having issues with a dj software that from what I have googled seems to be pointing to CPU clock running too slow. I wouldnt know much about this so have seeked any advise from somebosy who may know. I will post the results when I have access to my personal laptop in a few hours. Many thanks for your reply with this. I really apprrectaie it. Chat later. Thanks again. Until we have the requested information we have little to go on but from we do know it sounds like a possible driver or software conflict, this because it only happens with the dj software. Hi philpower2. Please see attached for screenshot and below for URL thanks. Just to note, my malwarebytes and AVG both blocked the CPU-Z link. I disabled both though so I could install I for you. It did however seem to install some other things too though like registry helper and some other scan your pc type programs. I guess I should try remove these somehow now that I have you the required info? Just to give you a little bit more background on the dj software issue im experiencing. Basically Im using a program called Traktor Pro 2. It gives the user the ability to mix using four virtual decks. However my system cant even handle two, despite having sufficient spec. The program load meter will frequently hit the red causing the tracks to lag. I've been trying to figure out what the issue is for ages and its so frustrating. I can rule out the settings in the dj program itself though. I use an external mixer so I use an Audio 8 dj soundcard, and also a Kontrol X1 midi controller. The spike definitely increases with the soundcard anyway. Im just trying to figure out what could be causing this. 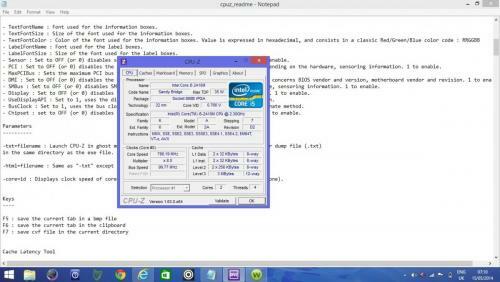 Through some research CPU running too slow has caused this issue for some, so that's what im trying to determine here. 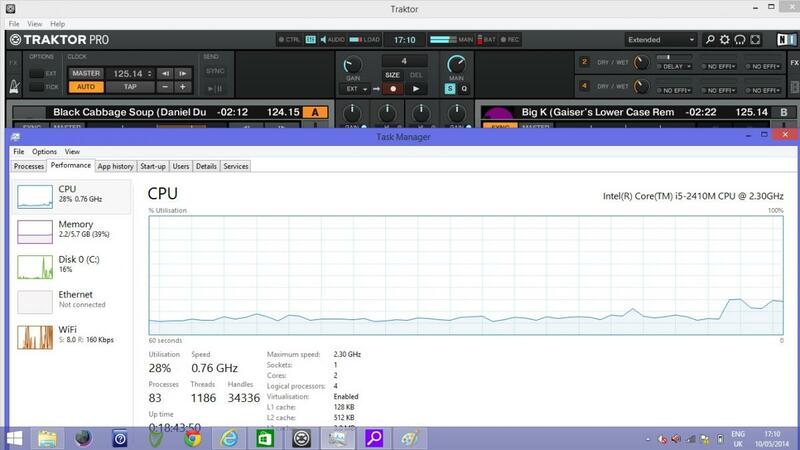 I have also attached a screenshot of the Process view and traktor together. As you will see the process view looks to be ok yet the trakor load is in the red. I have tried all the troubleshooting tips like turning wifi, antivirus off etc. but have had no joy. So something is conflicting somewhere as you say, but im just totally out of ideas. Thanks again so much for your advise. Really appreciated. I will take a look at the Speccy report and screenshots and add an edit if you have not had chance to do the bellow and get back to us. ... • Select "System Restore"
- The Driver Verifier needs to run as long as possible - even if the status screen appears clear. If your system does BSOD while the Driver Verifier is running, please retrieve the dump file from c:\windows\minidump and attach it to your next reply. Many thanks phillpower2. I will have access to my personal laptop this evening (GMT) so will follow the above steps and post the results in the next few hours. Just to note, I didnt have the Traktor dj program running or Sound card & midi controller plugged into their usb ports for the above URL and screenshot I posted. Would it be more benefitial to you If I provide these details with the actual scenario in practice? Likewise with your latest post regarding drive verifier etc. Will I plug in the soundcard & midicontroller when performing this. Excellent, I will setup the full scenario this evening (GMT) and post the results then. Thanks so much. Hey again, I have plugged everything in and have attached the CPU-Z screenshot and speccy URL below for you. For now can you just use the computer as you normally would to see if Driver Verifier trips over anything. AVG and daemonu.exe are two things that I am wary off, AVG because it hogs system resources and causes problems and daemonu.exe because it not only causes stability issues but also it compromises system security, see here and here. Going offline now as I have an early start + Ive been here about 16hrs today, back about 7am. I usually disable AVG before setting everything up. As for NVIDIA will I just uninstall anything NVIDIA related in control panel? Do you think my CPU is running too slow based on the attached info etc. Let me know anything else you want me to try. Thanks a million for this.